"SO GREAT A CLOUD OF WITNESSES"
The Evangelical Universalist Association is seeking support to spread the word of God's great love for all mankind. 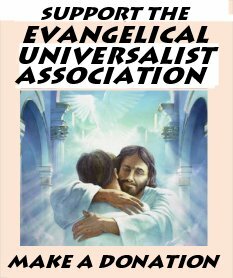 We are planning to start a publishing division as a platform for like-minded believers to express their faith to the world..
Support the cause of Evangelical Universalsim with a generous donnation today! BIBLICAL UNIVERSALISM has had many proponents throught the ages. In fact there are those who argue that it was the prevailing viewpoint of the Church for its first 500 years. Whether true or not, it is certain that many have held the view down through the ages, and today there is a growing resergence of the teaching among conservative bible believing evangelicals. Although no organized denomination of evangelical universalists exists today there are many biblical universalist congregations and ministries. We may be found sprinkled throughout the various evangelical denominations as well. Biblical Universalism has been given many names: It has been called Christian Universalism, Universal Restorationism, apocatastasis, universal salvation, inclusivism, the"wider hope" and many other labels. Simply put, it is the belief that in the end all sentient beings will be holy and happy through faith in Jesus Christ. Proponents of the Biblical Universalism included Origen, Clement of Alexandria, Marcellus of Ancyra, Titus of Bostra, Gregory Nazianzen, Evagrius, Didymus, Diodorus of Tarsus, Theodore of Mopsuestia, Fabius Manus Victorinus, and Gregory of Nyssa. During the reformation the Anabaptists of Germany taught universalism. There have been many English clergy and philosophers such as Dr. David Hartley, who wrote the "Observations on Man," Bishop Thomas Newton, Sir George Stonehouse, John Henderson, James Brown, D.D., Rev. R. Barbauld, and Rev. John Brown. Many english Libertarians such as Rev. Theophilus Lindsey, were universalists. James Relly began to preach Universalism in the city of London about 1750 followed by Rev. John Murray in America in 1770. Murray founded the Universalist Church in America which was a Biblical Universalist denomination until it merged with the Unitarians in 1961 and ceased to exist. Theologians Adolph E. Knoch and William Barclay were universalists. Canon F.W. Farrar and Canadian theologian Arthur Custance were sympathetic to the doctrine. Paul Revere, US President Abraham Lincoln, Clara Barton and Florence Nightengale were also universalists. It is evangelical universalism that we promote and defended on this website and not the liberal anti-biblical form such as that associated with the unitarian universalists. Contrary to false charges from our critiques we do not teach that God forgives sin without the blood of Christ. We insist that only through faith in Christ may any be saved. We do not deny that there will be many who must first suffer the pains of hell before they ascent to heaven. we simply deny that hell is of endless duration and that there is no possibility for repentace and receiving Christ for the lost in hell. Contrary to critical opinion, we hold to the plenary, verbal inspiration of Scripture. We teach that the Bible alone is the standard for all faith and practice.